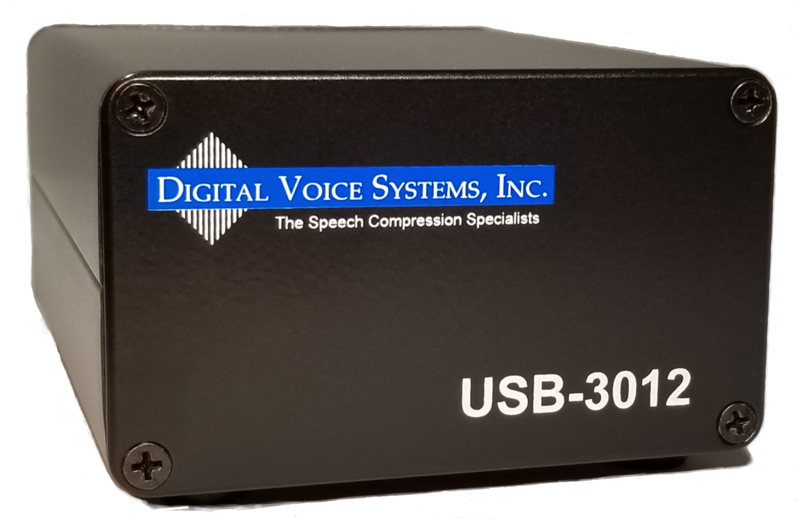 Westford, Mass – Digital Voice Systems, Inc. (DVSI) the recognized leader in the development of low-data-rate speech compression technology has introduced the USB-3012™, a multi-channel USB device capable of up to twelve full-duplex simultaneous encoder/decoder operations. The USB-3012™ is available in two models allowing it to meet a wide variety of customer applications. The standard USB-3012™ USB Device features DVSI's latest generation AMBE+2™ vocoder and offers interoperability with DMR, dPMR and MotoTRBO applications. The USB-3012™ P25 version also includes interoperability with APCO P25. All USB-3012™ USB Devices provide access to the advanced features and benefits of DVSI's vocoders that include: Voice Activity Detection (VAD), adaptive Comfort Noise Insertion (CNI) and support for DTMF tones. Whichever version is chosen, the USB-3012™ USB Device is the fastest and easiest way to access multiple channels of DVSI's vocoder technology. Integration of the USB-3012™ USB Device is simplified since drivers are available for a variety of operating systems. DVSI includes Windows based PC software so that users can install the USB-3012™ USB and begin to encode and decode files immediately. The USB-3012™ can play a key role in the development and production of real-time communication systems, including push-to-talk land mobile radio, satellite and wireless telephony. With off the shelf availability and no up-front licensing fees or royalties the USB-3012™ USB Device is a low cost alternative to a vocoder software implementation. The USB-3012™ USB Device enables users to quickly and easily integrate a DVSI vocoder while minimizing the engineering time and development costs associated with hardware demos/prototypes. The value of DVSI's USB-3012™ goes beyond its compact and easy to use design. The USB-3012™ USB can also be used as a comprehensive, evaluation, test and development platform to simulate actual system conditions as a quality control reference standard for production. According to Bob Maher, DVSI's Director of Sales and Marketing: "The USB-3012™ provides 12 channels of DVSI's most advanced AMBETM vocoder technology in a single USB Device. It is an ideal solution for manufacturers to develop multi-channel systems for critical applications where bandwidth is at a premium and voice intelligibility is imperative." Digital Voice Systems, Inc. specializes in the development of low-bit-rate, high quality voice compression products incorporating their patented IMBE™, AMBE® AMBE+™ and AMBE+2™ Voice Compression Technologies. DVSI software and hardware voice compression solutions are successfully implemented in both private and standards-based digital communication systems worldwide. DVSI's Speech Compression technology is the core component that enables original equipment manufacturers to produce innovative designs with an array of advanced features. Additional company information and product details can be found online at www.dvsinc.com. AMBE™, AMBE+™ and AMBE+2™ are registered trademarks and trademarks of Digital Voice Systems, Inc. and are protected by US and other patents and patents pending.